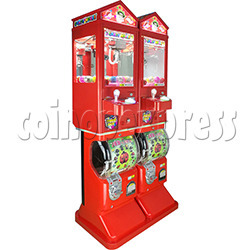 Machine with blue color or red color for option, the crane game area capacity is about 20pcs capsule toys of 48x55mm size, the capsule toys capacity is 150pcs capsule toys of 50mm size. - about the crane game, insert coins, shack the joystick to control the crane direction, aim to the capsule toy, press the push button within the limited time to descend the claw and catch the capsule toy, and take the gift from the exit. - about the capsule game, insert coins, and turn the knob clockwise, a gift fall down the spiral path, and take the gift from the exit.